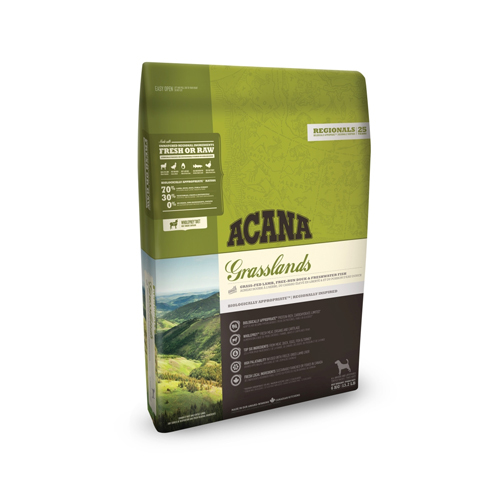 Acana Regionals Grasslands Dog is dog food with lamb and dog, supplemented with alfalfa and parsnips. It does not contain any grains or potatoes and is low in carbohydrates. Dogs have evolved as carnivores, with a biological need for a diet that contains a variety of fresh meat and fish combined with a small amount of vegetables, fruits and grasses. The Acana Regionals range is formulated with ingredients that are delivered to Acana's kitchens fresh every day and processed on the spot. Grasslands Dog contains lamb, duck, free-range eggs and fish. Acana produces natural pet food with local ingredients, taking into account the evolution of dogs. Their original diets were protein-rich and full of fresh meats. The ingredients are bought locally (Alberta, Canada). Acana Biologically Appropriate is formulated with fresh meat, fresh fish, vegetables, fruits and herbs suited to the needs of your dog. Raw grass-fed lamb (8%), fresh duck (8%), fresh whole eggs (8%), lamb meat meal (8%), whole herring meal (7%), turkey meal (7%), whole green peas, whole red lentils, whole chickpeas, fresh wild-caught northern pike (4%), raw lamb liver (4%), fresh duck giblets (liver, heart, kidney) (4%), fresh turkey meat (4%), lamb fat (4%), whole green lentils, whole pinto beans, whole yellow peas, sun-cured alfalfa, pollock oil (2%), lentil fiber, dried lamb cartilage (1%), raw lamb tripe (1%), dried brown kelp, fresh pumpkin, fresh butternut squash, fresh parsnips, fresh green kale, fresh spinach, fresh mustard greens, fresh turnip greens, fresh carrots, fresh red delicious apples, fresh bartlett pears, freeze-dried liver (lamb and duck) (0.1%), fresh cranberries, fresh blueberries, chicory root, turmeric root, milk thistle, burdock root, lavender, marshmallow root, rosehips. Have you used Acana Grasslands Dog Regionals before? Let us know what you think about this product.